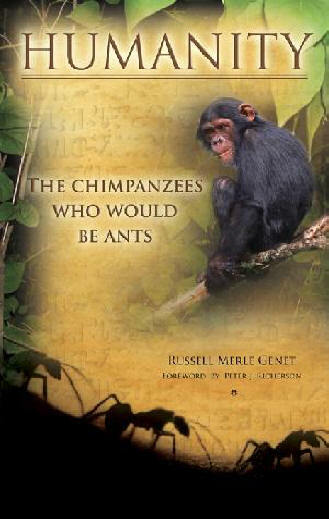 Humanity: The Chimpanzees Who Would Be Ants is the science-based story of how, in a remote corner of an ordinary galaxy 13.7 billion years after the Big Bang, the descendants of a third line of chimpanzees evolved into millions of humans who organized themselves into ant-like societies. Originally rare hunters, we humans took up agricultural ways, aping the clever ants that became numerous by developing ingenious herding and gardening skills. Evolving our simple chimp tools into machines, we then tapped a bonanza of fossil fuel energy and blitzkrieged the planet. Now facing planetary limits, what is our fate? Reversing direction, will we return to a planetary Garden of Eden or, pedal to the metal, crash into oblivion? Will we transform the Earth into a sustainable global farm or, leaving our birth-planet behind, voyage to the stars with our machine partners to establish a galactic empire?